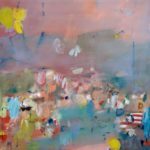 Abstract painters and artists Michael Gable and Natalie Petrosky open their shows at Summit Art space Galleries on Friday, January 18th from 5:00 pm – 8:00 pm. The opening reception is FREE and the public is encouraged to attend and experience abstract paintings by these artists. 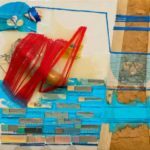 Gable’s intoxicating and richly colored paintings paired with Petrosky’s multi-media works with found objects open your eyes to fresh ways of looking and seeing. Michael Gable’s exhibition entitled, More Songs about Buildings and Food was inspired by the band, The Talking Heads and its 1978 album of the same name. It refers to the variety of references in his work and his reluctance to accept them. While the variety of works is experimental and drawing materials as diverse as oil and graphite, oil paint, markers and found photos used in unique ways, Gable is an artist who pushes the envelope with his work, testing himself in many ways. He graduated from Myers School of Art, University of Akron, receiving his BFA in 2003 with a Drawing and Painting concentration. During the past 10 years, he has exhibited regionally, being recognized for his work in juried exhibitions as an award winner and invited to participate in many area curated invitational shows. He has also been invited to exhibit at the Oldham Kramer law offices in 2009 where he showed small scale paintings and drawings. He currently lives and works in Akron, maintains an active exhibition schedule and has a commercial studio space on Akron’s west side. Show card artwork by Mike Gable.